Developed over 16 months by Mustool team, MT8206 has finally launched! MSTOOL MT8205 emphasis on functional combination for field testing process, not to replace the meter. It reflects the high-tech, using a dedicated chip has, as the wave function, you can view the waveform signal 10KHz within. 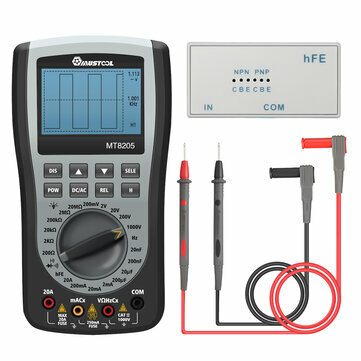 As a large number of measuring instruments waveform, you will find MSTOOL MT8205 is the most affordable one, spend the price of a multimeter, you can have a table can be seen, as the wave of the waveform, value for money! 1, 200ksps speed A/D sampling with double integral A/D combination, depending on the wave function of a key conversion. 2, The automatic waveform capture function, easy operation. 3, The software calibration technology, memory calibration coefficients. 4, Features include DC/AC voltag /current, resistance, capacitance, frequency, diode / continuity test. 5, Display hold, storage / readout up to 10 waveforms and 100 sets of measurement values. 6,128X64 high contrast LCD with LED backlighting. 7, Can choose to automatically shutdown or continuous operation. 8, 20A AC and DC test, built-in 500V/20A explosion proof fuse. Power consumption: less than 20mA. Storage capacity: DMM 100 groups of data, waveform 5 group records. Diode test: open circuit voltage of about 1.5 V, the maximum test current of about 1.5mA. Note:The voltage measurement problem has been resolved since the product version EONE ET201 was updated to BangGood customized version MT8205 . buon prodottoricco di funzioni e paragonato a strumenti blasonatimolto preciso.la struttura appare molto compatta e solida.valore molto più alto del prezzo pagato.speriamo duri nel tempo. Todo correcto, buen funcionamiento, recomendable. Adorei o produto, melhor até do que eu imaginava e a entre foi bem antes do tempo previsto.